David: Whereas some like my brother and his mountain biking friends prefer to be out bashing and thrashing through the mud and trees of a mountain bike course, my taste runs to a nice smooth trail pedaling at a sane pace and soaking in the sights. 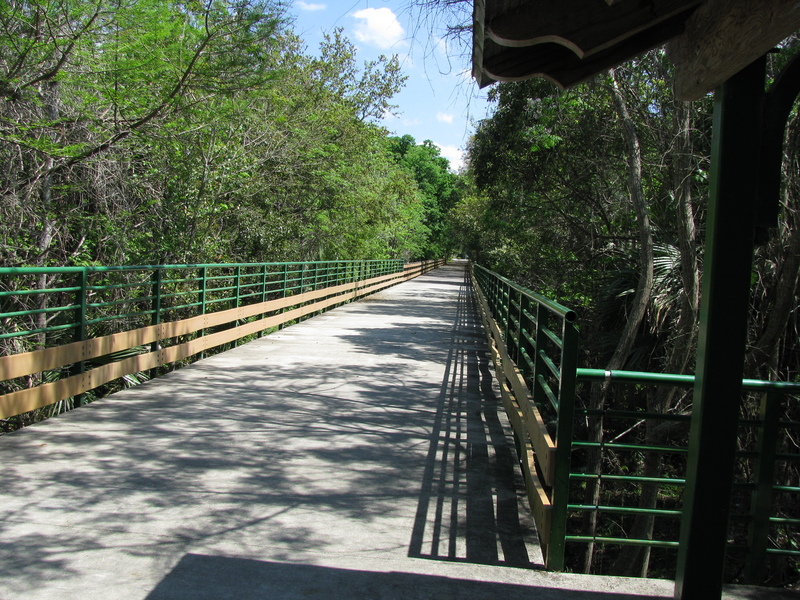 The section of the Cross-Seminole Trail from downtown Oviedo to Layer Elementary in Winter Springs is a favorite of mine with bridges, creeks, parks, wildflowers, wildlife and easy access. 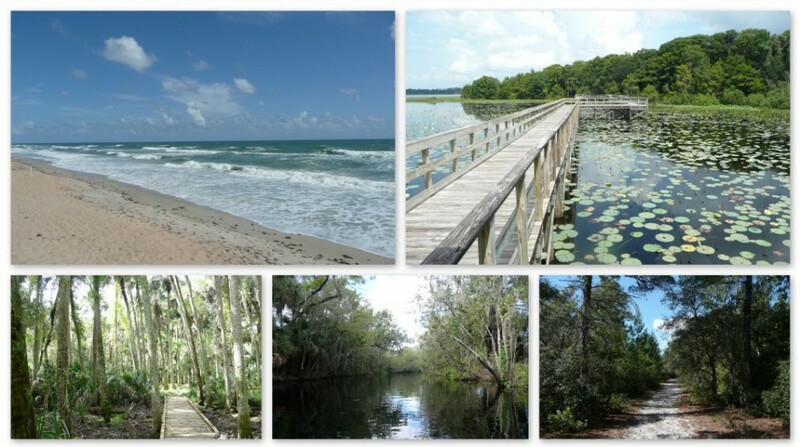 Access to the trail, for me, is usually the Black Hammock Trail Head. Any pre-ride “pit stops” can be taken care of at the facilities. 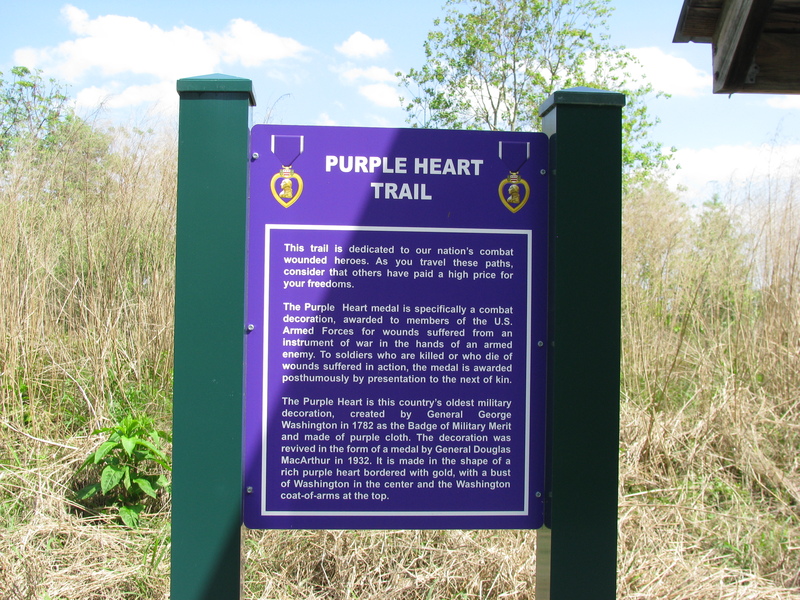 Here there is a sign dedicating the trail as a Purple Heart Trail…reminding us of the importance of the sacrifices of others. Just beyond, the trail forks – to the left is Oviedo with Winter Springs to the right. A gazebo beckons those seeking a respite. Exercise equipment is available for those having the energy. 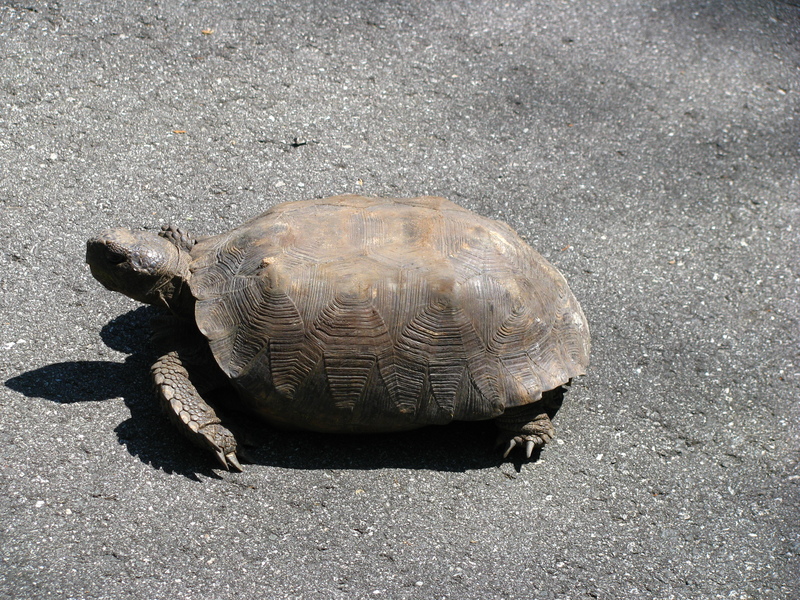 Taking the right fork, I came upon this gopher tortoise. I’ve seen my share of tortoises and other critters along this trail. Stopping one time to admire a coral snake, I had my sanity questioned by passersby. I’m good. 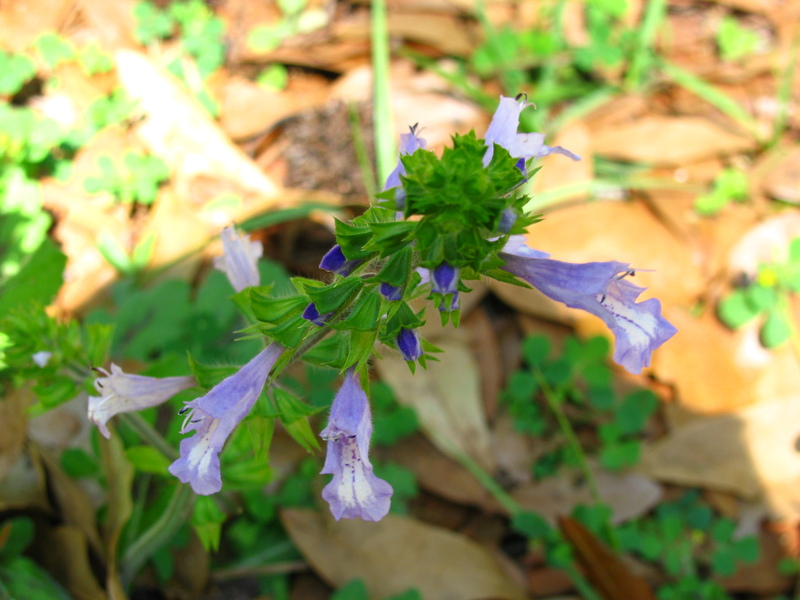 Wildflowers are present along the trail in, sometimes, great abundance and variety. 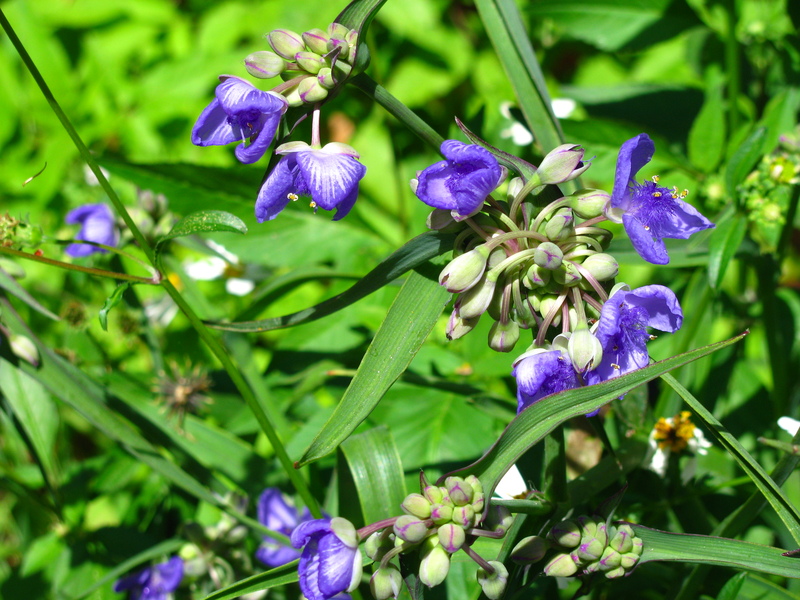 My eye tends to find the vibrant blues like these spiderworts and lobelias more than others. The Howell Creek bridge makes for a nice place to stop and contemplate a cool dip in the water below. Just don’t jump? 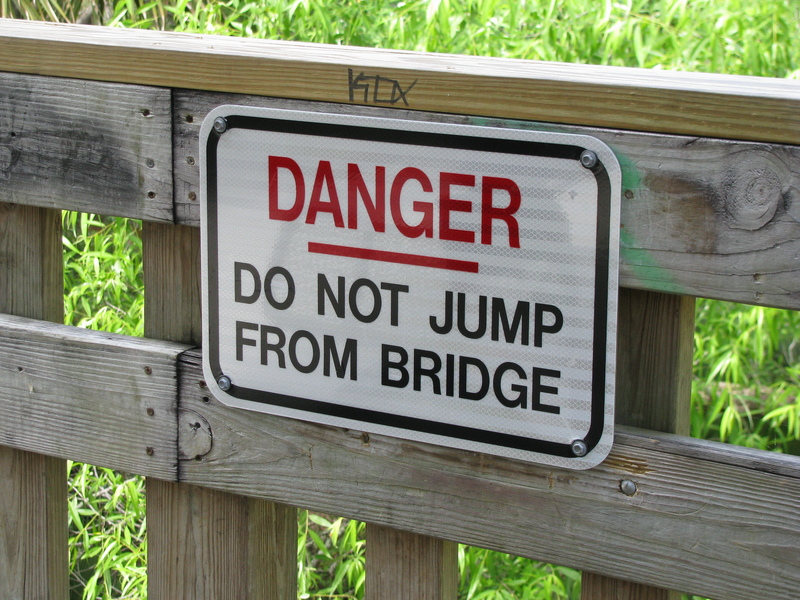 Maybe it’s me, but the bridge is about 20 feet above two feet (on a good day) of creek water…does someone really need to be told not to jump? 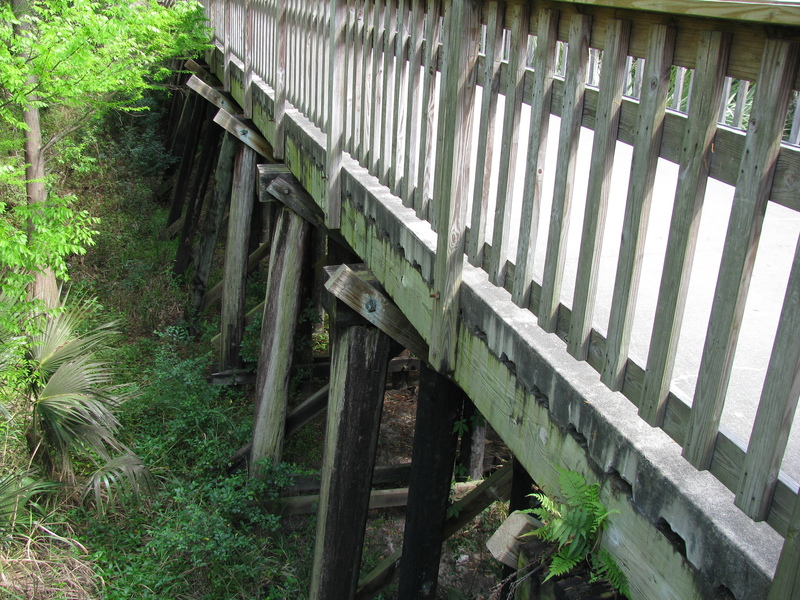 The stout base of the bridge shows its roots as a former railroad trestle. Sight-seeing over, it was back to the trail. No matter which fork in the trail you initially take, you pass through or adjacent to subdivisions. An interesting story might be told of how various adjacent property owners gain direct access to the trail. These accesses range from quite elaborate bridge-type structures and walkways, some with gates, to little more than a couple of wood planks spanning trail-side drainage ditches. Hmmmm…note to self. 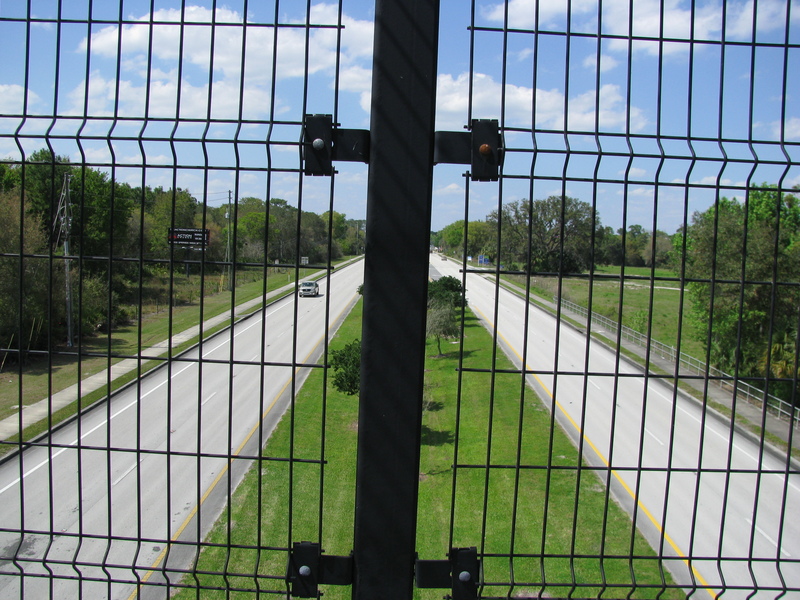 Continuing on past Howell Creek, the next “bridge” is the S.R 434 (Alafaya Trail) overpass. 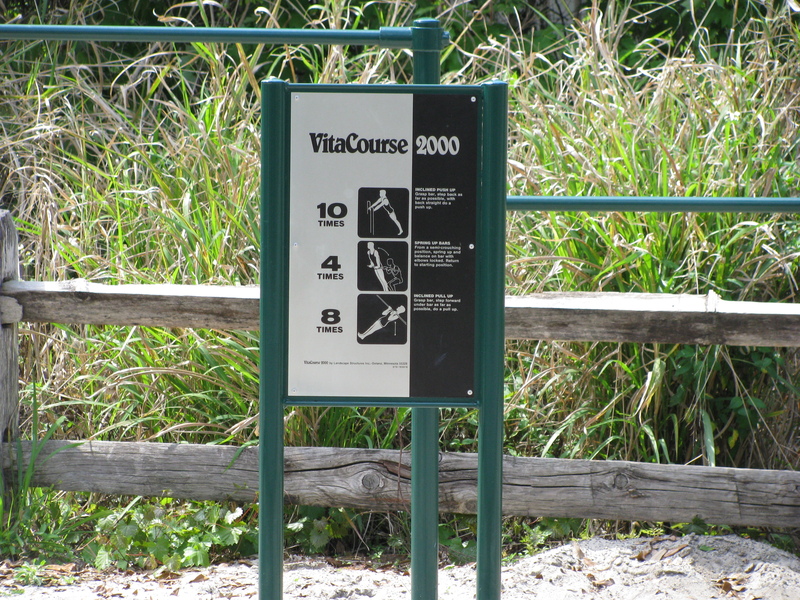 You see folks take different approaches, depending on fitness level, to get up and over this structure on bicycles. Some get off and walk the bike, some “tractor” up in their lowest gear and with legs pistoning and then there are those that sail over with hardly a drop in forward momentum. I’m pretty much between the latter two, but do usually stop for a second on top for a look around. The thrill, of course, is coming down the other side. Hands off brakes, speed builds pretty rapidly. The last thing you would want is someone or something to cross or stop in front of you…messy for both parties! Look back and know you’ve conquered this beast, but don’t get too cocky as it’ll be there when you come back. The trail ended right about here a few years ago. 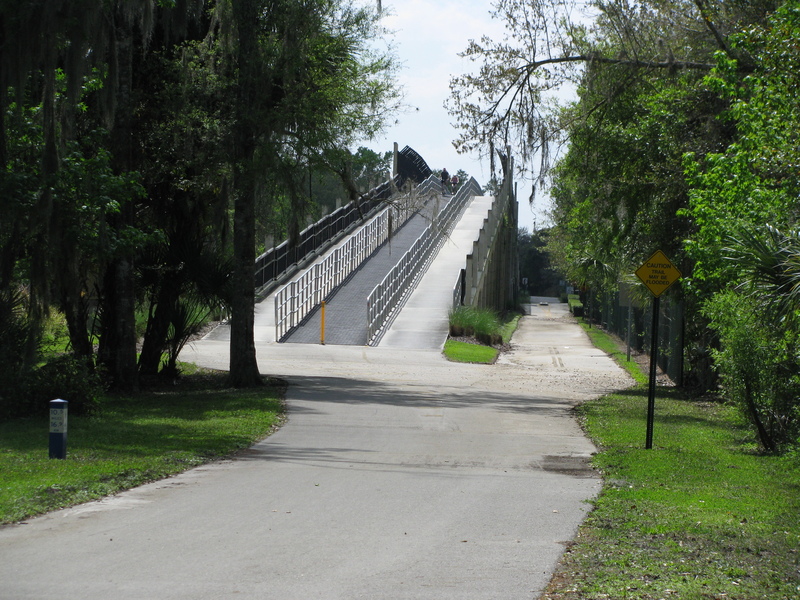 To continue to Winter Springs and pick up another completed trail section meant taking the trail to the right (in the picture above) of the overpass and travel the sidewalk along SR 434. No such detours necessary here. 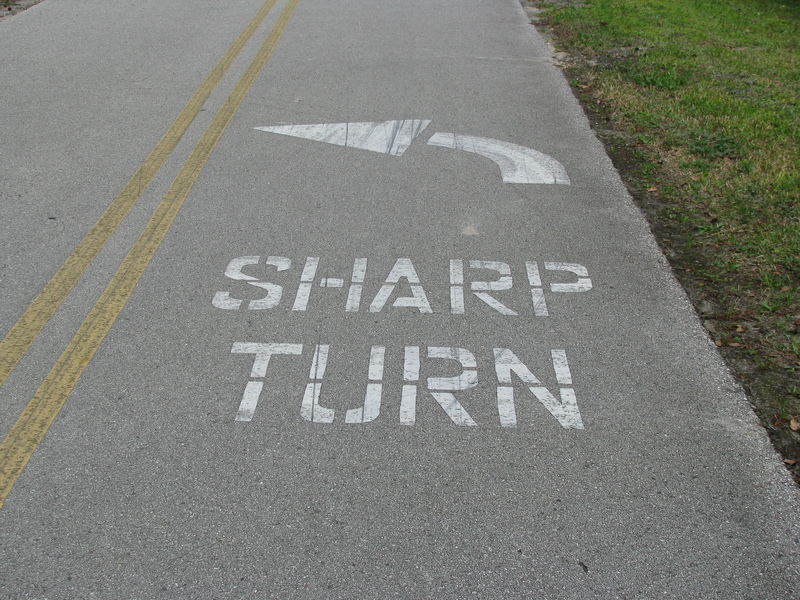 Just keep rollin’…with caution. Failure to heed the warning above could, I suppose, have some consequences…like a faceful of forest. 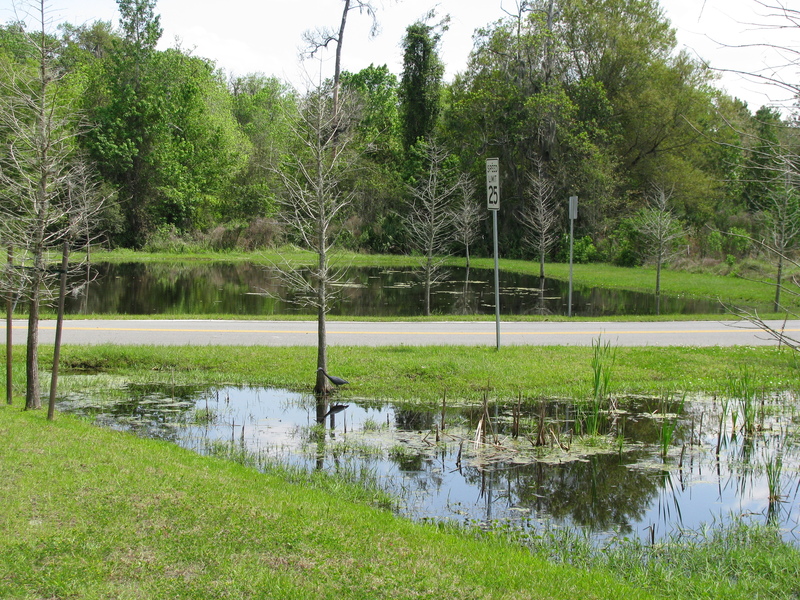 Stormwater ponds are meant to treat stormwater runoff before that runoff can carry nutrients, metals and other contaminants into lake and rivers. These “wet ponds” along the trail seem to mimic a more natural pond setting. 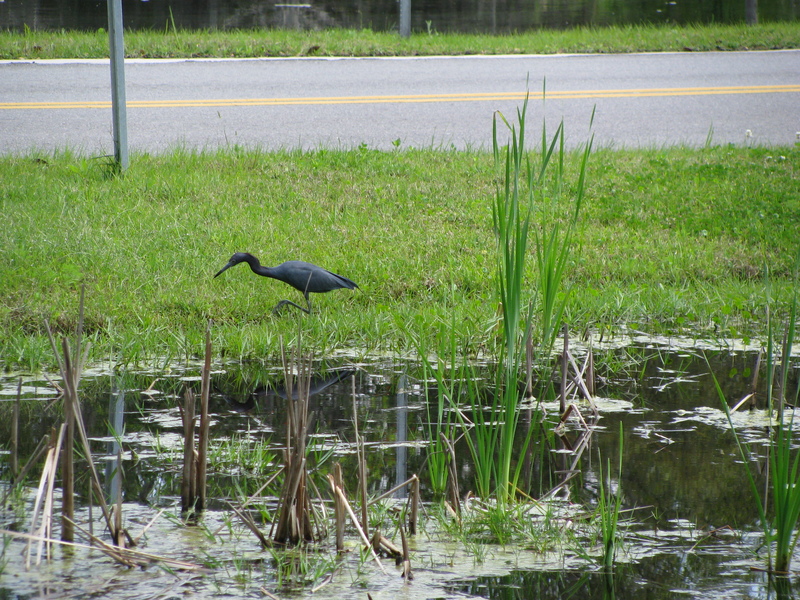 Natural enough for this little blue heron anyway. 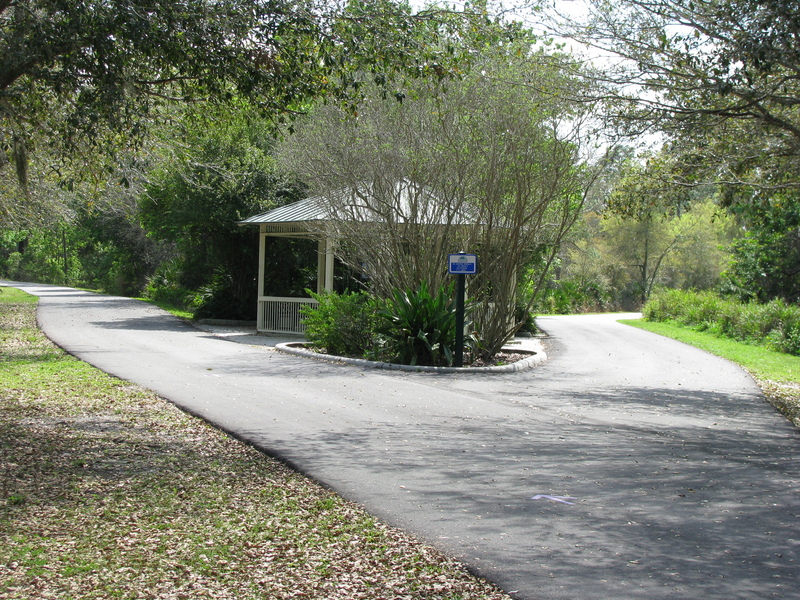 The trail pops you out into downtown Winter Springs and continues between Winter Springs High School and Central Winds Park. 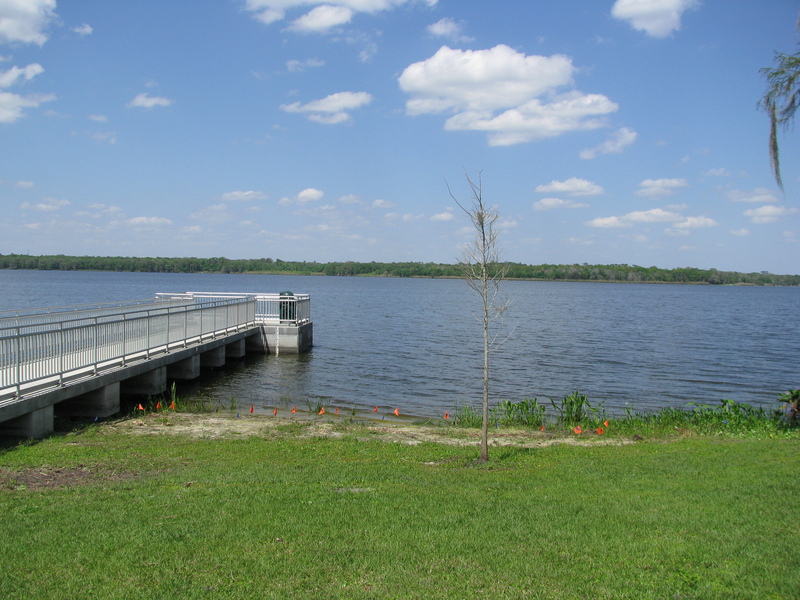 There is parking here along with this pier and open grassy area. There is also a structure like a patio, a stormwater pond and some mechanical equipment (water treatment?). 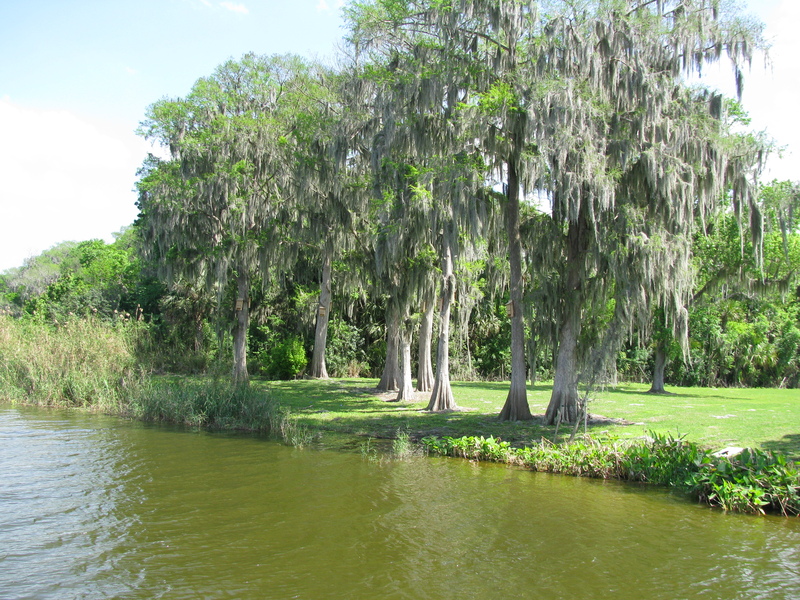 I’m more interested in the lake and the shoreline which boasts some very large cypress trees. Like the top of the SR 434 overpass, this place has become a favorite of mine to stop and check things out. Leaving this area and getting back on the trail takes you past more athletic fields where you might see a soccer or baseball game. Sometimes you can watch RC aircraft being put through maneuvers which is kind of cool. If there is a section of this trail that bores me a bit it is what comes next – a straight section rolling past subdivisions and paralleling the road. 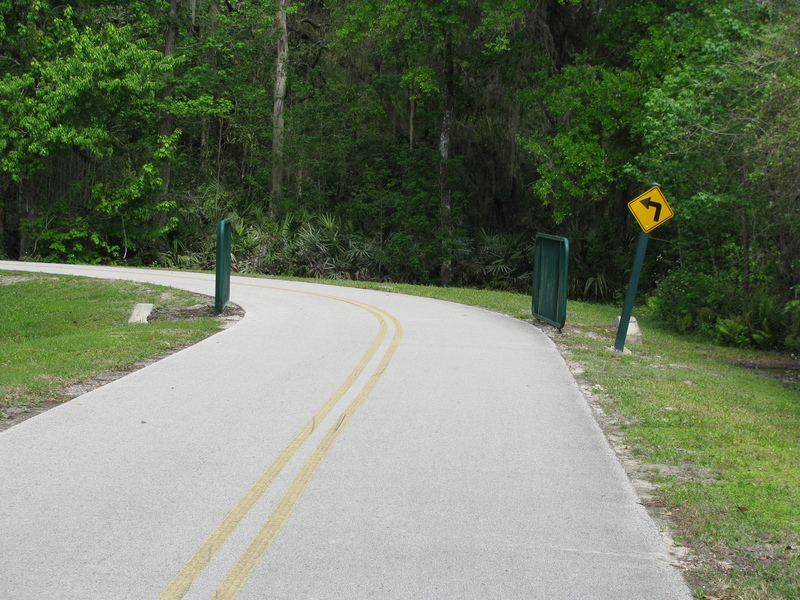 There are a number of ingress and egress roads to the subdivisions that puts trail users in close proximity with vehicles. A “streetscape” mindset to the planting of vegetation along this section of trail – some buffer trees, benches and median plantings at intersections – is apparent. Thankfully, this section of trail leads back into the wooded environs of the Gee Creek bridge. 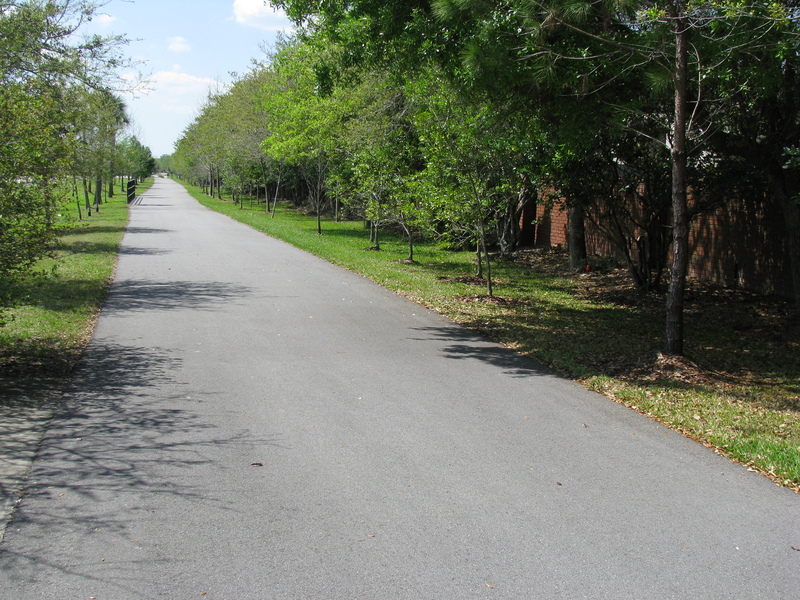 The noise from the traffic along SR 434 is muted by the surrounding thick vegetation and the fact that this section of the trail begins to parallel the less-traveled CR 419. I like to stop here, grab some water and give “that upon which I sit” a break. 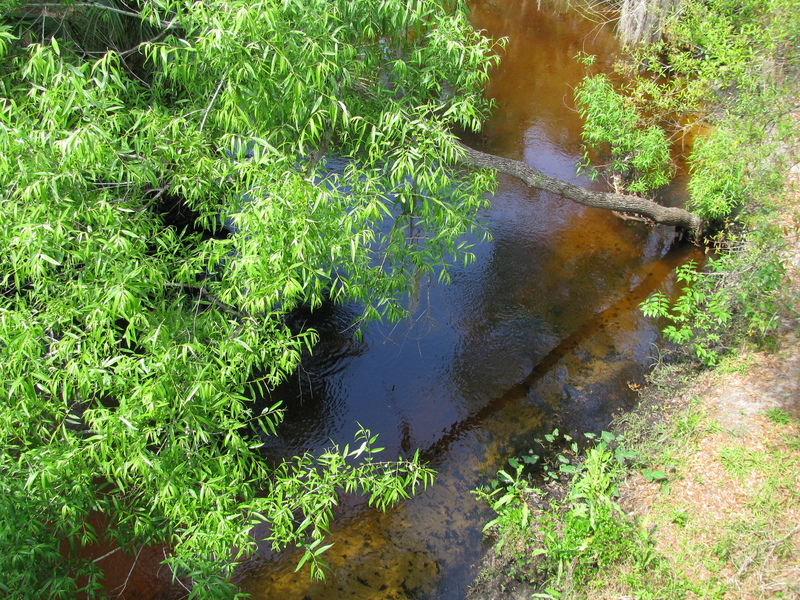 The creek usually passes under the bridge as an almost silent trickle. Rains before this trip had kicked things up a bit and I could hear the water running towards Lake Jesup below me. A fitting end to this little excursion. Now, wasn’t that a relaxing ride? A bunny- and tree- hugging biology-type with an appreciation for what nature has to offer.